Stop the Ear-Splitting Crying! Immediately Understand What Your Baby Wants to Tell You! Find Out Exactly What Your Baby Wants or Needs! How to Immediately Get Started Understanding and Stop Guessing What Your Nonverbal Baby Needs and Desires! Are you sometimes ready to throw up your hands because Baby is crying and you don't know what's bothering him? Don't you want to know exactly what your little one is screaming for? Are you worried that your baby is too cold, too hot, hungry, has a tummy ache, or simply wants a diaper change? Your baby can tell you all that and more by simply using these easy-to-follow Baby Sign Language illustrated charts. When Your Baby Can Immediately Tell You What's Bothering Her, You'll Have a Much Happier Baby! "My wife and I did baby signs with both our daughters. ...It was all about bonding with them more and cutting down on the number of meltdowns they'd have because they could 'tell' us what they wanted. I'm so glad we did it and I recommend it to all new parents." We know the anxiety a parent experiences when your child is crying and you don't know why can be unbearable! But not so with these easy-to-use signing charts. Why is Baby Crying? Ask Her! Rejoice! She Can Tell You! Gone are the days where you try to feed her, but find she actually has a bellyache! Understand what's going on with your little one and fix it fast! Our baby signing poster signs are accurate, created by true and native American Sign language users, so you KNOW you are getting the right signs for your baby. He'll be clearly understood! These signs are not made up, as most other baby sign language products and other baby sign websites tend to do. These signs are ALL recognized by the standard led by top sign language universities, such as Gallaudet University, NTID, and CSUN. This is a TERRIFIC benefit because ANY other people who know American Sign Language will understand your baby! When you use made-up signs, these are only recognizable by you and your baby. This hurts your chances at finding daycare, baby sitting, and even hospital care, and other child care places who will understand your baby's wants and NEEDS. Get Your Baby's Attention Quick! Babies LOVE These Posters, too! Kids are featured on these posters, NOT ADULTS. Did you know that babies especially love to look at (and respond delightfully quickly to) photos and illustrations of other babies! Not only are these posters featuring babies and children as the signers, they also have fun smiles that engage baby every time he looks at the vivid colorful images! These posters (and videos) focus on the signs that babies and children REALLY use and TRULY need. This way, you can answer their needs that much sooner, without going through pages and pages (or videos) of 800 signs, when all you need is just the ONE important sign NOW for QUICK understanding of your dear! Save Time; Understand What Your Baby Needs FAST! These posters are arranged by activity, so that it's easier to find that sign you're quickly looking for. These posters aren't HUGE eye-sores! They all large enough to see and follow all signs clearly, while being compact enough to fit in the smallest of wall, fridge, and nursery room spaces! Build Trust With Your Baby! And babies cry even more mostly because we don't understand their needs right away. With these posters at your disposal, you can easily teach baby the top 'survival signs' you need - immediately. Other baby signing sites might tell you to use the same sign for 'milk', 'bottle', and 'nurse'. This confuses your baby! When your baby wants a bottle, she can tell you what she wants IN HER BOTTLE, and not just a bottle – which leads to more guessing on your part and a frustrated baby. Stop guessing! When your baby wants milk, she can specifically express the exact sign, and when baby wants to nurse, you'll also know. Knowing the specific differences in baby's eating, drinking, and health needs makes a huge difference in their lives. Baby will trust you, knowing that she or he can tell you exactly what she wants, which lowers frustration IMMEDIATELY. Baby knows that you won't have to guess which type of drink or closeness of nursing that she needs. This type of unspoken bond is unbreakable. These baby sign language posters come with very simple visual instructions, which are easy to follow the minute you look at the poster! This means less guesswork, and faster usage of the signs, and a happier baby. We've taught hundreds of baby sign language classes to universities, court houses, daycares, pediatric hospitals, pediatric doctors, etc. We have a FULL understanding of babies and their communication modes, as well as a full an deep understanding of American Sign Language. Be careful of the other regurgitaters out there! Anyone who has taken the time to even read 1 or 2 pages of this website can see that our understanding SHINES through! Get the signs you need in one convenient printable pack! Simply place posters in any room that you need to quickly access the signs! I.E. Bathtime signs can go in the restroom, bedtime signs can be posted in bedroom, food signs poster can be easily attached to your refrigerator, survival signs can be posted in baby's playroom, on the fridge, in the den with Dad, etc! And remember, you can print as many copies as you need for other areas of your home, grandparents home, or baby sitter's residence! These posters are easy to see at a distance, have step-by-step instructions, and easy-to-view signs that focus on the SIGNS, clearly. Synonyms are also noted, for boosting your baby's growing vocabulary even further and faster than typical babies who don't sign! Bring These Posters On the Go! Easily Access Via Your iPad, iPod, iPhone or Android Device! These specially made baby sign language posters even work on your favorite mobile device! Get beautiful, CLEAR resolution posters on your iPad, so you can bring ANY sign with you for when YOU and your BABY need access. Imagine, while waiting for your ride, you and your little one can look at the posters together and learn even more signs, while you hang out! This is also perfect for when you bring your little one to the library, parks, relatives' homes, etc! And even better – NO WIFI CONNECTION NEEDED! Just touch your screen, and there they are! No muss, no fuss. And yes, these posters also work on most Android devices, including tablets made by Acer, Amazon's Kindle Fire, Asus, Toshiba, Dell, HP Tablets, Google's Nexus, Lenovo Thinkpads, Microsoft Surface Tab, Samsung Galaxy Note Tablets, Sony Xperia, etc. Q: My baby can hear. 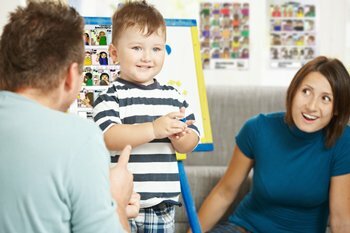 Are there any benefits to teaching my hearing child baby sign language? A: Yes! Learning baby sign language builds confidence - your baby knows he can communicate more effectively, thereby reducing or possibly avoiding unnecessary frustrations and tantrums! Q: When should I start teaching my baby signs? At what age is the best time to start? Q: Won't learning sign language cause a speech delay? A: No. Research proves that babies who learn to sign, actually speak earlier than non-signing babies. Signing babies also tend to accumulate a larger (vocal) vocabulary than non-signing babies. Q: How should I introduce the signs? A: Starting with basic signs, you will want to sign the word each time you say it to your baby. For instance, use the sign for milk while asking your baby if he wants some milk. Repetition works best. Q: Is it too late to start my 12 month old? A: Nope! Babies benefit at any age in learning baby signs. Baby signs benefit babies anywhere from 4-36 months old. Q: Is Baby American Sign Language hard to learn/acquire? A: It is fairly simple to incorporate a few signs into daily activities [such as: mealtimes, bath time, playtime, story time you share with your baby. Gestures are naturally and easily absorbed by babies and toddlers, making it easier for parents to delight in the same! Q: Where Do I Put These Posters? A: That's the awesome flexibility of these charts! You can place these posters in any room that your related activity occurs! So, most people like to place their 'food signs' poster in the kitchen and/or the pantry, bath time signs are easily posted in your restroom, bedtime signs in baby's room, etc. You can also place any or all of these posters inside of a nice binder to bring with you wherever, whenever! You also can keep these charts on your iPad or Kindle Fire ® and truly bring them with you everywhere! Q: How Many Signs and Which Signs Do I Begin With? A: The most common sign parents begin using is milk, followed by more, eat, please, and thank you. Our son's first sign was doggie! All of these signs are accessible on your chart! Confidently bring your baby places out in public, such as restaurants, without being embarrassed because you'll know what he wants without screaming tantrums, feet kicking, red puffy faces, etc! Get a head start with educating your baby about the world around her! Babies can also fingerspell, did you know that? Our little one SPELLED his first word at age 9 months! Good thing we included an alphabet poster in this kit also for you and your angel! Give your baby a headstart on becoming bilingual! Mounds of research shows that the sooner baby starts learning visual and spatial language from such an early age, learning as many as 2, 3, or more languages becomes a breeze for your little one! Imagine bringing your toddler to church / movie / concert and having her quickly tell you she needs the bathroom without the rest of the audience knowing too! Learn signs faster; they are conveniently placed wherever you want or need them! Learn with these posters, along with sharing learning with your baby. You can both enjoy learning from these friendly, colorful posters at the same time because there are pictures of babies AND pictures of the objects that each sign represents, which also helps baby learn how to associate each sign with the intended usage, higher learning of vocabulary words, and some word recognition! Research has shown over and over that babies who sign, typically read faster than children who did not have the chance to learn baby signing. Seeing baby faces on each posters makes it also fun for baby, which brings even more attention to the signs. Baby likes to see these images, and illustrated photos, so your baby gets excited to sign them, and you get a happier and more contented baby because he can sign these concepts to you, and KNOWS he can trust that you’ll attend to his current wants or needs. These poster charts are also portable digitally and designed in a special way that fit all iPad screens, and most Android tablet screens. This way you can bring the signs wherever you’d like, and access them as needed! Happier baby, and all his needs are attended to QUICKLY, even while on the go! When you buy a single poster from another company, you are limited to THAT poster, sitting in ONE room of your home. These can be printed for grandma and grampa, dad’s office, your local daycare, etc. Your Baby Will Delight You With Earlier Communication and Sign -- Satisfaction GUARANTEED! Get all money back, if you're not satisfied! 100% Money Back Outrageous Guarantee. Our ironclad guarantee! If your little one doesn't product a sign within 2 to 6 weeks, please ask for your money back. If you AND your little angel don't LOVE these posters, you may return them ANY TIME within the next 730 Days for a refund. (Yes, that's 2 years!) 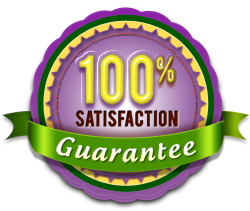 Most places will offer you a 10 day guarantee, some will go out on a limb and offer you a 30-Day promise, and some will generously go as high as a 60 day guarantee. We are SO CONFIDENT that you and your baby will love learning from these posters that we guarantee your money back 100% no questions asked, for a whole two years! Age three is about the time that your little ones will be chattering about, and we offer you this long to try it out and have a blast with your little one. 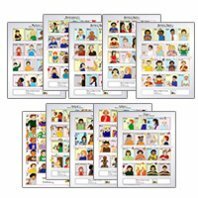 And check this out - If you find another baby sign language poster set that guarantees as long as we do – we'll double your money back. Yep, honest to goodness. Just Click the Button Below To Start Signing With Your Baby Today!